As the academic year commences we’ve teamed up with Voucherbox to look at how you can stock up on the best beauty bargains simply by shopping around! With this handy guide, you could save up to 26% on your favourite brands! We’ve got top money-saving tips to make sure you don’t pay over the odds when you replenish your makeup bag in time for the start of university! Women’s average spend on beauty products in the UK is £20 a month! However, only 35% of us regularly price-check! It turns out that 13% of us are guilty of never price-checking and 53% of us fail to regularly compare prices… oops. 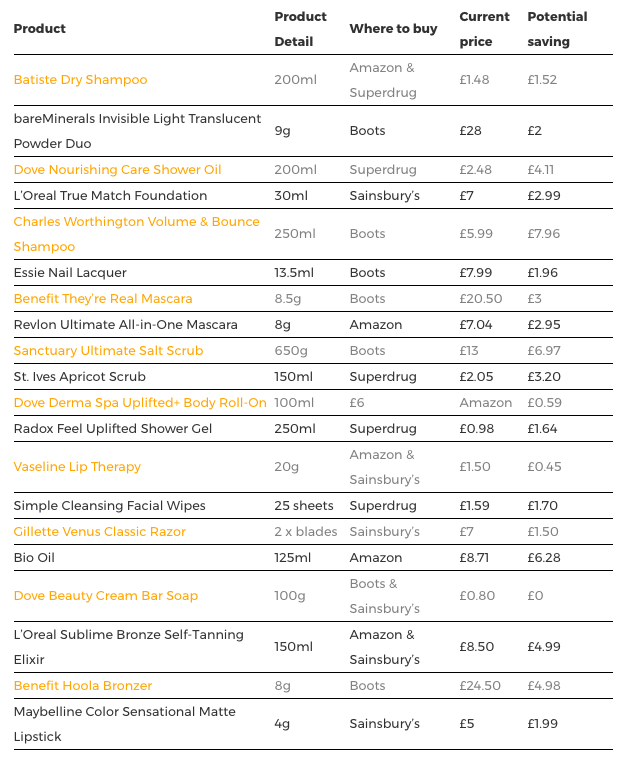 Voucherbox.co.uk found that an average shopping basket of 20 popular beauty products amounts to £220.09. However, research shows that women could therefore be missing out on £56.67 worth of discounts by not shopping around – meaning they’re losing out on a saving of 26%! Ouch. To avoid this we wanted to share some new research which has found that you might be spending more than double on best-selling beauty products depending on where you shop! Popular items such as Batiste dry shampoo, Bio Oil and Radox shower gel see price hikes of up to 167% depending on whether women visit Superdrug, Boots, Amazon or Sainsbury’s… yikes. When comparing the 20 beauty products, research found that some items can double in price depending on where you shop. Bio Oil buyers can save up to £6.28 by shopping at Amazon over Boots and Superdrug. Meanwhile if you’re in the market for Simple facial cleansing wipes then head to Superdrug where this product is £1.70 cheaper than at Boots. On the low-budget beauty spectrum, popular lip salve Vaseline can be scooped up for 30% less than the Boots price (£1.95) by shopping at Sainsbury’s and Amazon (£1.50) – a 79% saving. Just one out of the 20 products studied shows consistent pricing across retailers – the Dove Beauty Cream Bar. This household favourite can be found at both Boots and Sainsbury’s for 80p and despite this being a best-seller, the product wasn’t on sale as a single item at Amazon or Superdrug.